If you have a small kitchen then today’s post is for you with these simple kitchen storage solutions for small spaces. Even if you are lucky and have tons of room keep reading you might just find an idea you would like as well. Maybe you’re renting… We do, although we are extremely lucky when it comes to kitchen space; or you’re just living in a smaller home with a more compact kitchen design. Either way the lack of kitchen storage is an issue for a lot [I mean a whole LOT] of people. It seems even when we have large kitchens it’s easy to run out of storage room. Renovating would seem like the logical route right? The issue is renovating costs lots of dough for the homeowner and renters, well most landlords aren’t going to buy off on that idea. Keep reading for some kitchen space saver ideas to make the most of what you got. Probably the biggest issue in a small kitchen is counterspace. There is just never enough room to work. I know you want to break out your culinary genius self but your kitchen just keeps telling you no. The best solution for this problem is making room for rolling kitchen storage carts. This is especially handy if you need to roll it back into the dining room [or wherever] when not in use. They have some really great options too. My MIL has one that she keeps right in the middle of her kitchen and uses it like an island. If you have the extra floor space but just lack counter area then I definitely recommend this option. Speaking of counter spaces, another great idea for a small kitchen is a stove cutting board. The stove and sink take up good valuable work services but because you can’t cook and clean without them they are kind of necessary. Having one of these stove cutting boards or even a sink cutting board would definitely come in handy. Another item that can take up premium counter and drawer space are knives; although most of us still need knives for you know things like chopping. A simple kitchen storage solution is to purchase a magnetic knife holder. They also have them double magnetic that will attach to the fridge. Which would ultimately save wall space as well. Just make sure if you have littles that you make them unreachable. Small functional kitchens work the best when you have solutions that really work for you. 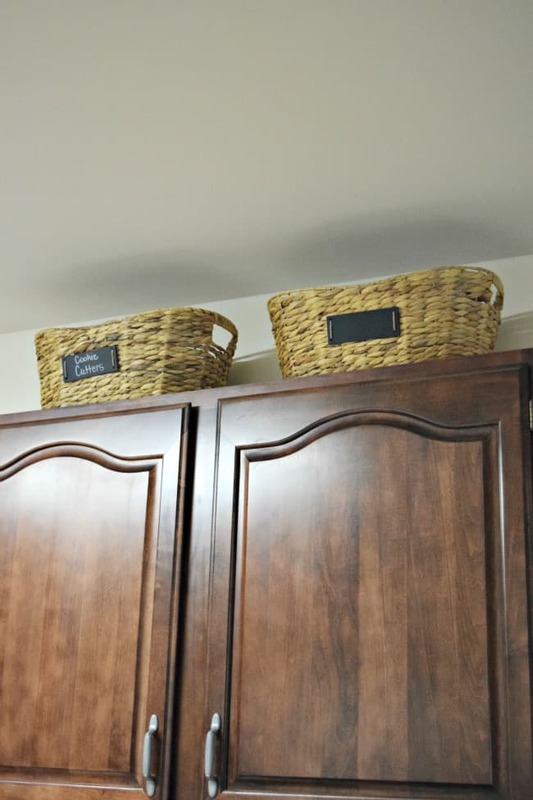 One way that I keep organized with extra storage is by using baskets over the kitchen cabinets. This space is always underused because it is up high and typically unreachable without a ladder. But that doesn’t mean you can’t make use of this great area when you are tight on space. I like to store items such as cookie cutters and small kitchen appliance attachments. It could also be great for seasonal items and other less used things like light bulbs. 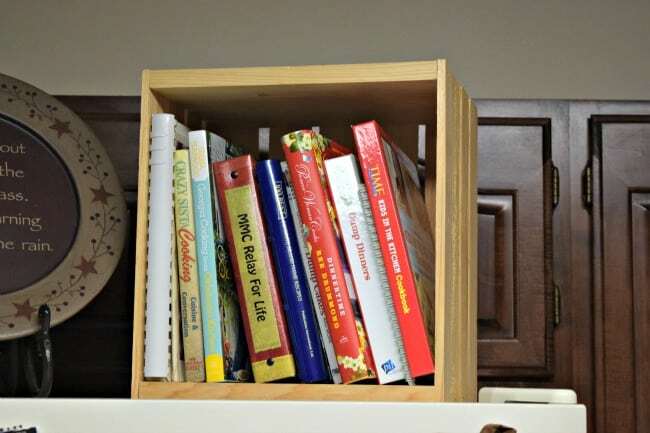 I also store items above my fridge, like these cookbooks in a wooden crate. It keeps them all nice, tidy and out of the way but still perfectly reachable for when I need one for recipe research. 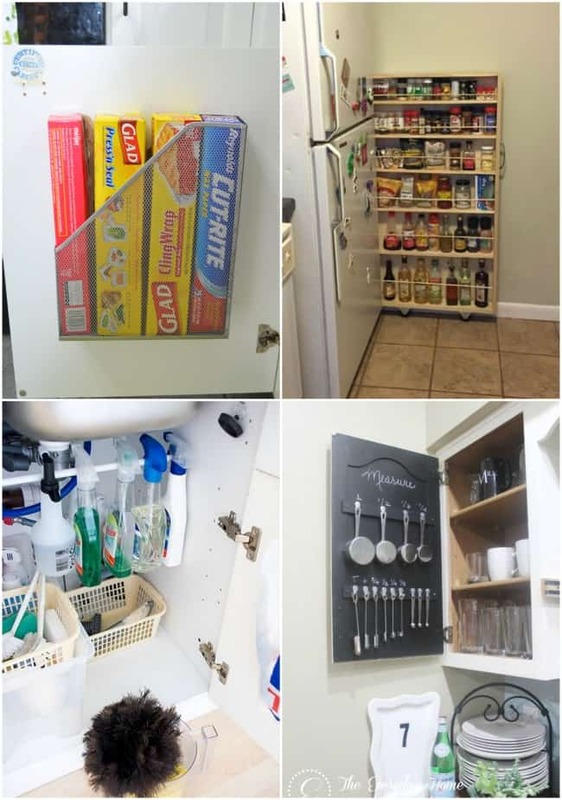 Here are a few more great diy kitchen storage solutions! 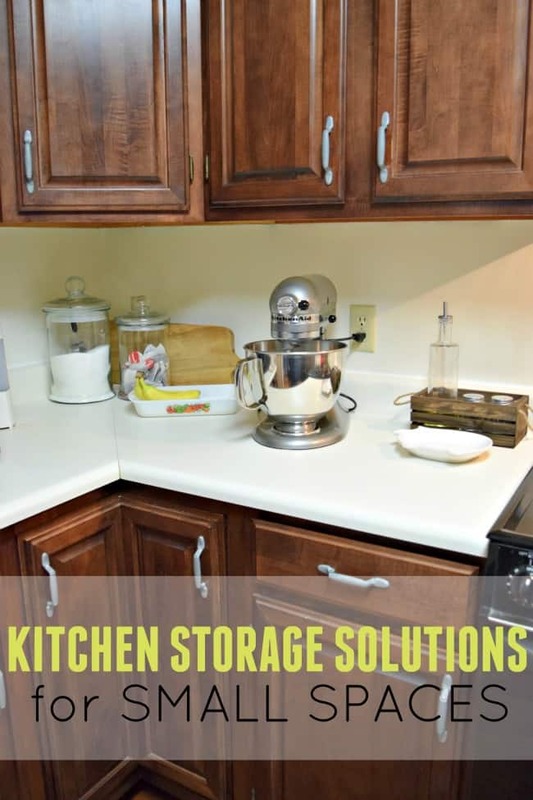 I hope you found these ideas for a small kitchen helpful and if you are still looking for more kitchen storage solutions for small spaces then be sure to pop over and follow me on my pinterest board. Follow Melissa | This Girl’s Life Blog’s board Kitchen Ideas Small Kitchens on Pinterest. Do you have a small kitchen? Any creative ideas we didn’t discuss here? Best way to organize jewelry!